Four degree programs of BSU were subjected to accreditation from July 1 to 5, 2014. These programs are the Bachelor of Elementary Education (BEE), Bachelor of Secondary Education (BSE), Bachelor of Science in Home Economics (BSHE), and Bachelor of Science in Agribusiness (BSAgB?). 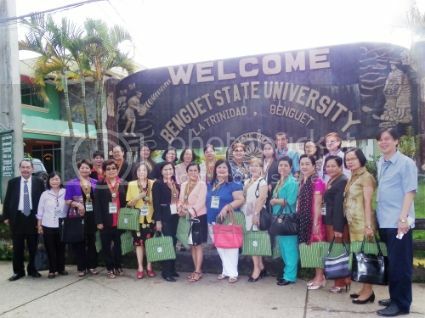 The Accrediting Agency of Chartered Colleges and Universities in the Philippines (AACCUP) survey team comprised of 20 members led by Dr. Thelma T. Lanuza of Isabela State University arrived in BSU on July 1, 2014 for the Level IV, Phase I survey visit of these programs. The accreditors were welcomed by BSU President, Dr. Ben D. Ladilad, and other BSU officials. During the opening program on July 1 held at the Strawberry Hall, Dr. Ladilad gave the accreditors an overview of the University’s plans regarding cross-border education and international accreditation. He also mentioned the steps taken towards implementing these plans like the current upgrading of laboratory facilities as well as the scholarships availed by the junior faculty members. On the other hand, Dr. Lanuza expressed her appreciation of the University’s warm welcome to the team. She added that the purpose of such is to follow up what has been done about AACCUP’s recommendations from the last survey visit. “I would like to congratulate you for reaching this stage. You are the 17th among SUCs to go through Level IV, Phase I and thank you for believing in the importance of accreditation,” she said.